In 2001 I was invited to Ski with My friends Pat & Ken Miles. It was a very cold trip and even colder going back to Seattle. I actually carried 2 studded spare tires to insure I got there. 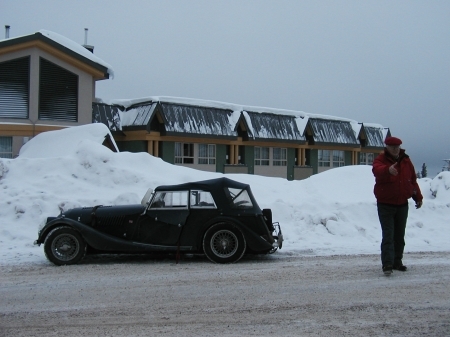 The first and last time I used a Morgan to go skiing. Sorry: I was at the Big White Ski Resort near Kelowna, BC, Canada. BTW: As I have travelled a lot in the +4, it is heavily modified. Wow!! I've owned my 4-seater for over 40 years, and haven't made a single one of those modifications, except Koni shocks in front. They are all great ideas, except maybe the Laycock de Normanville OD, which I believe requires cutting through one of the chassis cross-members. The only serious "modification" I've made is to get a Bimini top which has greatly improved the driving experience on hot summer days. I used it ten times as often as the standard top. Regarding ski trips, I'll take your advice and leave the Morgan at home this February. These things can be done! I don't ski but have been known to drop by the cafes for a bowl of soup when out in the winter. I also have a Bimini Top made of Sunbrella. It has saved Me more than once. Yes the cross member must be modified by cutting off the Moss Box Rear mount platform. I did a neat job of this and have the mounts as well as the platform so I can weld it back in. I have had this OD for years but now rarely use it. Only on the Motorway and I avoid the Motorway or as We call them "Interstate". This Mod is not worth the Expense nor added complexity. I am also very hard of hearing. So 5,000 RPM is No Problem. Thanks for your opinion regarding overdrive. I have felt negligent for not installing an overdrive or more likely a 5-speed gearbox in my Plus Fours, but now I feel better. I am working on a kit car based on a TR4, and had intended to install Laycock de Normanville OD in it since it's a straight bolt-on on a TR4 chassis. But now I will save that for last and maybe skip it altogether. The trick is a well balanced engine and bad hearing. It might just be me but I instantly thought snowmobile upgrade pack option! How do you manage those unplowed roads in a MTW? If you keep the front wheels on the track, then the rear wheel will be in the snowy middle. If you keep the rear wheel in a track, then won't the front wheels be on the snow?